Adapted from an article by Ellen McKoy at Trucking Times. Quick. What’s the first thing you’re likely to notice when a vehicle is approaching from the opposite direction? Or, when looking in the rearview mirror at the vehicle behind you? If you said grille guards, you’d be right! Whether it’s a seven-slot Jeep® grille, a crest on a Cadillac Escalade, or BMW’s kidney-shaped grille, automakers have been embellishing the front end of their vehicles for decades. Though OEM grilles actually serve a function by admitting cooling air into a vehicle’s radiator, they’re primarily cosmetic, designed to make a vehicle more attractive and build an automaker’s brand identity. Because a vehicle’s front end is a focal point, it was only a matter of time before customizers would seize the opportunity to develop their own distinctively styled front, enabling vehicle owners to personalize their vehicle. One of the earliest innovators was E&G Classics, now E&G Corporation. Founded in 1972, the company first made its mark producing custom Cadillac grilles and nowadays offers applications for cars, trucks and SUVs. In recent years, as light-duty trucks have become a favored mode of transportation for both personal- and commercial-use owners, front-end treatments have proliferated. 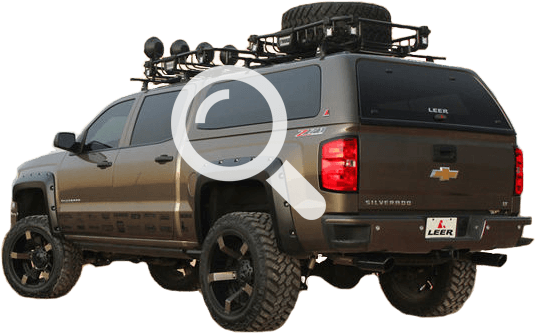 From replacement grilles, grille overlays and light bars to grille guards, bumpers and bull bars, applications for pickups, SUVs and CUVs abound. From all reports, manufacturers are bullish on the market. Of course, there’s the style or appearance factor. But more important than aesthetic appeal alone, is the surge in truck sales. Lower gas prices, improved fuel efficiency and their inherent versatility have made light-duty trucks the vehicles of choice for countless truck owners. 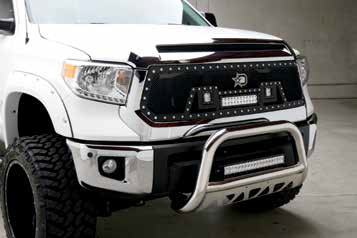 Some products, such as grille guards, bumpers and bull bars, also add a layer of front-end protection. According to Bob Orth Jr, Go Industries’ president, “Fleet business is still a big part of our grille guard sales. Strong SUV and heavy-duty truck sales (and) the desire for grille guards made in the USA that genuinely protect the front end” account for the company’s growth.